Posted on June 23, 2017 by Lauren M. Graham, Ph.D.
On June 15, 2017, Richard E. Engler, Ph.D., Senior Chemist at Bergeson & Campbell, P.C. (B&C®), presented at Products as Solutions to Real-World Sustainability Challenges: Incentives & Barriers, a session at the 2017 Green Chemistry & Engineering Conference (GC&E). Dr. Engler’s presentation, “TSCA, its effects on renewable feedstocks, and how TSCA reform has changed things,” provided an overview of the Toxic Substances Control Act (TSCA) and aspects of TSCA reform that impact green chemistry, including both biobased materials and sourcing from byproducts or other wastes. 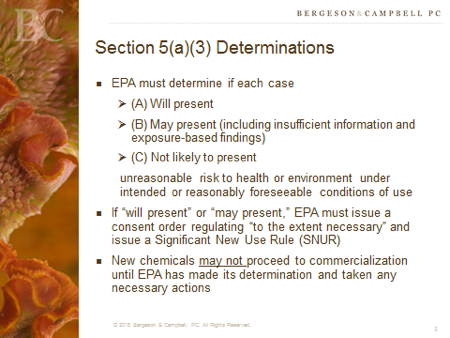 The presentation discussed how the use of a chemical substance determines TSCA regulatory requirements for the entire supply chain, including starting materials, intermediates, and catalysts (including enzymes and microbes). 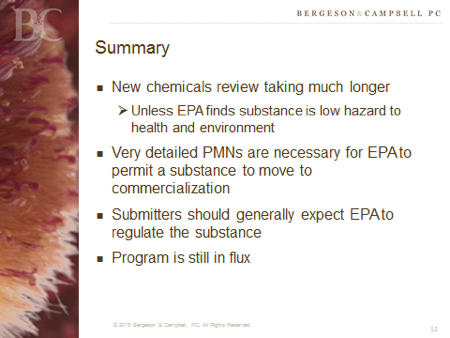 To demonstrate this point, Dr. Engler reviewed scenarios under which TSCA reporting requirements for byproduct generators and processors would change based on how the byproduct is processed and used. Dr. Engler highlighted the need for communication on TSCA reporting throughout the supply chain to ensure compliance and minimize potential commercial disruptions.